The United Nations Committee on the Rights of the Child held a very important Day of General Discussion in Geneva on the topic of protecting and empowering children human rights defenders. The Committee collaborated with Child Rights Connect and organized the day of discussion. 21 children were selected to be part of the Child Advisory Committee who shared their opinions and worked together with Child Rights Connect in representing the views of children human rights defenders. I represented the Inter-American Children Institute at the Day of General of Discussion with two of my fellow CORIAS: Axel and Amy. The 3 of us got the chance to attend the discussion and share our opinion regrading the topic of protecting and empowering children human rights defenders. We each using our personal experiences reflected on the topic. 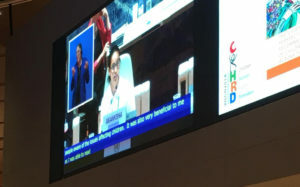 As a panelist it was my role to reflect on how I related to the document created by child rights connect for the children human rights defenders. I choose to discuss my personal experience which was how social media has helped me become an active member in my community and has been a successful platform for me to share my opinion with my fellow defenders. The DGD was very important for empowering children human right defenders. One of the main topics discussed at the debate was problems children face when acting as defenders and the most common problem that came up was not being taken seriously. Most children felt that many adults around them did not take the views of children seriously because they are just children what do they know about society. This is a huge issue since children feel downgraded when they are not taken seriously thus, making it more challenging for them to speak up against injustice. So, it is very important the children are supported by the adults around them when acting as children human rights defenders as this will make children feel more empowered. The DGD had many different activities like working groups, plenary speakers, moderators in which children could take part. Children from all around the world took part in the discussion, making the DGD a memorable experience. Overall the DGD was an amazing experience filled with wonderful stories and opinions of many different children human rights defenders. The day was a great opportunity for children to share their views and opinions. Events like the day of general discussion should continue in the future so that even more children human rights definers are empowered.